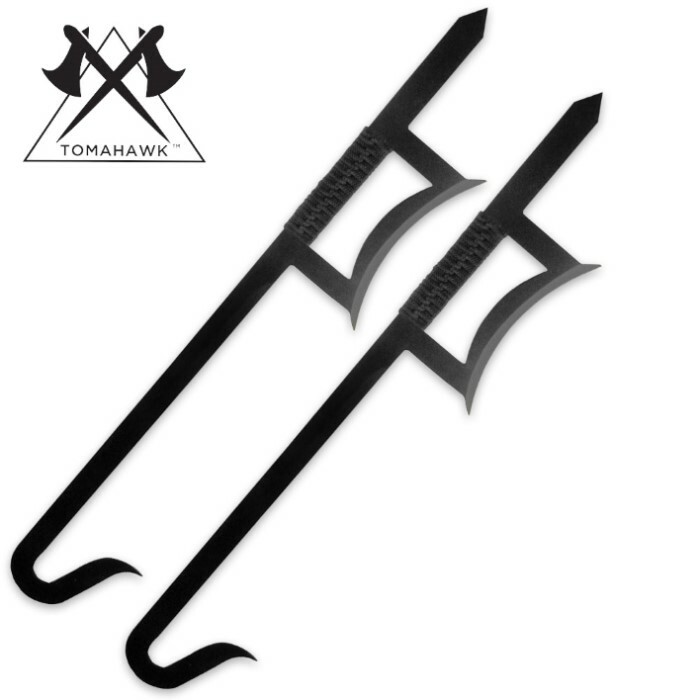 2-piece Chinese Hook Sword Set Black | BUDK.com - Knives & Swords At The Lowest Prices! 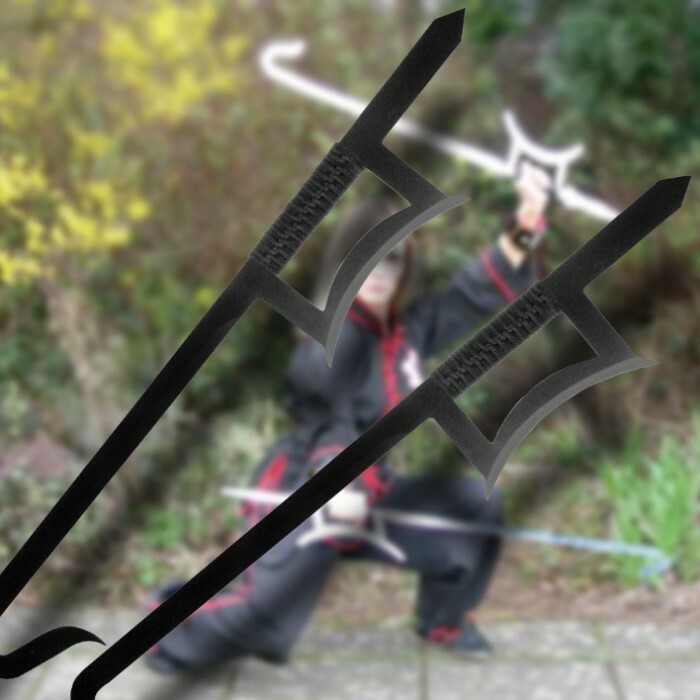 Dominate your dojo with these Chinese twin hook swords! Martial arts enthusiasts will enjoy using these traditional weapons! Each sword measures 33 1/4" overall and offers one-piece stainless steel construction and authentic pattern design with a black finish. Overall very good. All the points are sharp, the blades not so much. A bit of a bend in one of the swords' hooks - not a problem though. Be careful with these as there are so many potentially dangerous points and edges. this is the first item I got from this site and I have to say I am well satisfied. the shipping was easy to deal with could look up on any day where it was at arrived when it said it would and the quality of the product is awesome. The blades came with an nice edge will have to sharpen it just a little bit and the weight feels good in my hands. The only nitpick is that the handles with the Paracord probably will eventually come off I don't see that happening for a long time though. Was really excited for these, just a little disappointed that they weren't sharp, and the paracord handle wasn't my style but really enjoy the uniqueness of it. I would buy again as a gift. Just got mine yesterday, very fast delivery time, not very sharp but still good swords. Plan on having lots of fun with them. i found this item to be quite nice and built quite well. it is not as sharp as I thought it would be but it is still of great quality. I would buy it again. These are really amazing swords. They were good size, looked really cool too. These are really good in sword fights, but they dented really easy, but other then that they are great!!! I got my swords today and i was pretty happy. They very cool and they could deffinately kill a zombie. The only problems were that when i got them neither of them came sharp. Except for the blade next to the handle it is pretty dull but i fixed that easily with my whetstone. I don't know if they are meant to be sharp. another thing is that i like to cut boxes but the black on the metal rubs off. So if you get them to look at then they are great but for cutting stuff it takes the paint off. These swords are amazing, their unique, and unlike most swords they can be used for more than just cutting and stabbing.All i can say is ninjas beware.